By the turn of the 20th century, the exodus of Manhattan’s wealthy from Millionaire’s Row on Fifth Avenue below 59th Street was well under way. In 1900 Mary Augusta King commissioned architects James R. Turner and William. G. Killian to design her new residence at 991 Fifth Avenue just steps from the corner of 80th Street and far north of the encroaching hotels and businesses. Mary was the widow of John King who had died in September 1875 leaving an estate of around $5 million--in the neighborhood of $113 million today. The King cottage in Newport, completed in 1847, was the largest and more impressive house of its day. Included in her husband's will were his extensive real estate holdings both in Manhattan and Newport. Mary was not only a highly-visible socialite; but a shrewd businesswoman. She continued to wheel and deal in real estate; including converting her four-story former mansion at No. 431 Fifth Avenue for commercial purposes.. Completed in 1901, her lavish new Beaux-Arts style mansion uptown was a showplace. With a rusticated limestone base, the first three floors bowed out creating a stone-balustraded balcony at the fourth floor. The architects chose ruddy-colored brick with carved limestone detailing for the middle three floors, capping it with a dramatic mansard roof with three elegant copper-clad dormers. Here Mary lived with her five Irish servants for only a few years until her death in May 1905. Banker David Crawford Clark purchased the home on April 16, 1906. A member of the firm Clark, Dodge & Co., Clark and his wife were socially prominent and in 1911 commissioned Ogden Codman, Jr., to redesign the interiors. In the meantime, millionaire William Ellis Corey, the president of the United States Steel Corporation, was raising eyebrows. The year that the Clarks bought No. 991, the steel magnate became smitten with an actress, Mabelle Gilman. 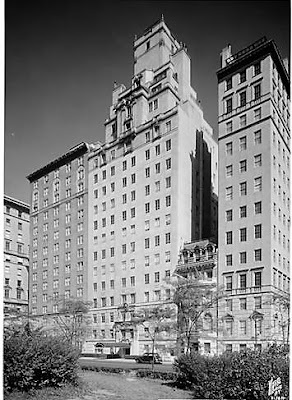 In a string of events that shocked New York society, Corey divorced his wife and openly courted the entertainer, finally marrying her in the Gotham Hotel on May 14, 1907. The giddy Corey gave his new bride a French chateau valued at around $1 million as a wedding present, while public opinion boiled over. The New York Times referred to Miss Gilman as “the actress for whom he had already sacrificed the wife of his youth,” and a spokesman for the United States Steel Corporation hinted that the president would be forced to resign. “When a man occupies a position as prominent as that of President of a great corporation like the Steel Corporation, or the Pennsylvania Railroad, or any similar semi-public position, he is expected to observe the ordinary forms of propriety,” he said. In 1918 Corey purchased No. 991 5th Avenue and the house became, according to The New York Times years later, “the scene of brilliant functions.” Neither the grand home nor Corey’s millions would keep Mabelle happy, however, and in 1923 she divorced, leaving him to live out his life alone in his Fifth Avenue mansion. William E. Corey died on May 11, 1934, leaving the house to his son. In 1939 the American Irish Historical Society purchased the residence for $145,000 and moved in a year later after renovations were completed. The Society, which was founded in 1897, houses a vast collection of Irish and Irish-American artifacts, newspapers, rare books and papers and hosts lectures, readings, concerts and other events. By 2006, the house was what the president-general of the Society, Dr. Kevin Cahill, called “in a state of utter disrepair.” The basement regularly flooded, the electrical and plumbing systems were outdated and the masonry required overall restoration. An aggressive, two-year restoration and renovation was initiated under the direction of Joseph Pell Lombardi. In some cases, the walls were taken down to the studs and lath before the building could be brought into the 20th Century and returned to its original grandeur. Original drawings by Odgen Codman Jr., maintained in the New York City Department of Buildings, were consulted to ensure accuracy. The $5 million restoration was completed in March 2008. 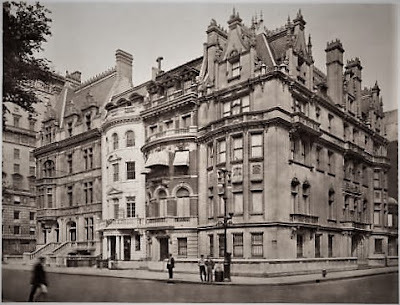 Today the rich Beaux-Arts mansion with its equally-rich society history is vised between soaring 21st century structures, while losing none if its century-old architectural integrity.